There’s nothing “standard” about Mendota’s Wide Standard Collar. Available in two different widths, ¾” and 1” wide, this color will stand out against the coat on any breed of dog. Between the brass buckles and quality craftsmanship, this leather dog collar is as good looking as it is functional. 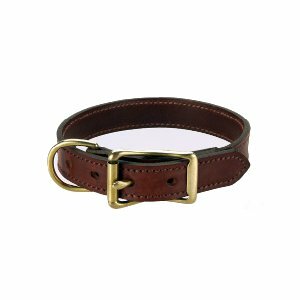 The brass roller buckle allows you to find just the right fit for your dog. The brass D-ring allows you to attach your favorite Mendota leash! ¾” Strap is available in 10"-12"-14"-16"-18"
1” Strap is available in 14"-16"-18"-20"-22"-24"